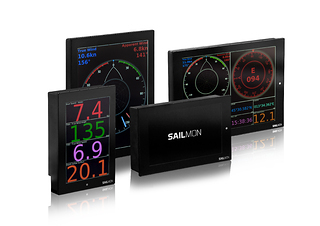 SAILMON have launched their new Model X & Model VII Instruments and the SAILethernet and SAILpower network devices. A Powerful new ARM processor, faster flash storage and faster discrete graphics, delivers even more performance and capability to Sailmon's System whilst drawing less battery power. The SAILMON signature remains the unrivalled, totally automatic viewing in bright sunlight or total darkness. The displays are completely configurable, delivering fast, accurate and reliable data using algorithms designed and used by Pro Sailors. The Model X and Model V11 provide a choice between using Ethernet or Powerline for data transmission on the Sailmon Network. Previously using its own network, the new SAILethernet Box now makes it possible to integrate the SAILMON System into the Yachts network. This gives installers and integrators even more scope to use the power of Sailmon. With its multitude of inputs, the SAILMON S-BOX remains at the heart of the system which can be installed completely standalone using NMEA2000, or as an upgrade/retrofit to almost any older systems that have been fitted to racing and premium cruising yachts over the last 10 years or more. By retrofitting SAILMON, you add functionality and capability to the existing system on board, without having to dump expensive instruments or sensors that are still working. At the same time you bring the system into the 21st century with fabulous displays, accurate information and complete control of what you want to see, when you want to see it whatever the point of sailing.